He excoriated Samuel Alito as too "conservative." He promoted amnesty for 20 million illegal immigrants. He abridged citizens' free speech (in favor of the media) with McCain-Feingold. He hysterically opposes waterboarding terrorists and wants to shut down Guantanamo. He denounced the Swift Boat Veterans for Truth. He opposes ANWR and supports the global warming cult, even posturing with fellow mountebank Arnold Schwarzenegger in front of solar panels. 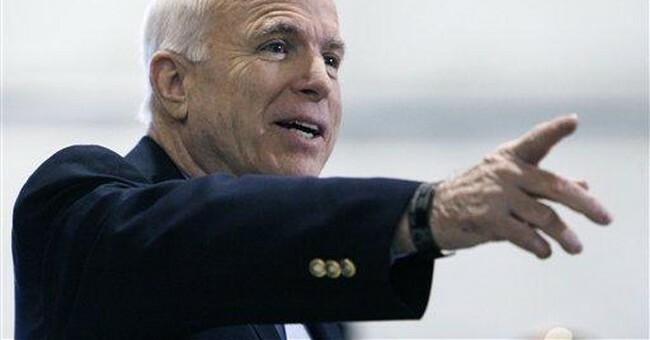 Although McCain has the minimum pro-life record demanded by the voters of Arizona, in 2006, McCain voted in favor of using taxpayer funds to harvest stem cells from human embryos. He opposes a constitutional amendment to protect human life. And he frets that if Roe v. Wade were overruled, women's lives would be "endangered." This is the same John McCain who chides Mitt Romney today for "flip-flopping" on abortion. At least Romney flips and stays there. Of course the most important issue for pro-lifers is the Supreme Court. As long as Roe v. Wade is the law of the land, it doesn't matter how many hearts and minds we've changed. So it's not insignificant that McCain has called Justice Samuel Alito too conservative. We ended up with David Hackett Souter when a Republican president was actually looking for an Alito. Imagine how bad it will be when the "Republican" president isn't even trying. McCain uses the boilerplate language of all Republicans in saying he will appoint "strict constructionists." This is supposed to end all discussion of the courts. But if he's picking strict constructionists, he will have to appoint judges who will commit to overturning McCain-Feingold. That could be our litmus test: Will you hold President McCain's signature legislation restricting speech unconstitutional? In 2004, McCain criticized the federal marriage amendment, saying, it was "antithetical in every way to the core philosophy of Republicans." Really? Preventing the redefinition of a 10,000-year-old institution -- marriage, that is, not John McCain -- is part of the core philosophy of being a Republican? I had no idea. I'm not a lawyer -- oh wait, yes, I am -- but Republicans were proposing to amend the Constitution, a process the Constitution specifically describes. It's like saying it's antithetical to the core philosophy of Republicans to require presidents to be at least 35 years old. It's in the Constitution! And Republicans -- other than the ones who voted for McCain-Feingold -- support the Constitution. You might say it's part of our core philosophy. Of course, back in 2004, McCain was considering running on a presidential ticket with John Kerry. Realizing that this would not help his chances to run as a Republican in 2008, when he would be a mere 120 years old, McCain quickly withdrew his interest in being on Kerry's ticket. But he defended Kerry from the Bush campaign's suggestion that Kerry was not tip-top on national security, saying on the "Today" show: "No, I do not believe that he is, quote, weak on defense." So that was helpful. But McCain conveniently forgot the second of these constitutional duties just a year later when Vice President Cheney was required "to break a tie vote in the Senate" on a matter of utmost importance to liberals: federal judges. Just one year after McCain had correctly identified one of two jobs of the vice president, he was indignant that a Republican vice president might actually exercise one of them. Better to let a gaggle of 14 Senate malcontents pick the president's judges for him. As part of the "Gang of 14," McCain hysterically opposed allowing the vice president to break a tie on judicial nominations. Following the Constitution with regard to the role of the vice president, McCain said, "would be a terrible precedent." Yes, if members of Congress actually read the Constitution, they might realize McCain-Feingold is unconstitutional.